Egg tarts are undeniably one of the best representatives of Hong Kong food. The egg tart (’dan tat’ in Cantonese) is a kind of custard tart pastry popular in Hong Kong, southern China and other Asian countries, which consists of an outer pastry crust that is filled with egg custard and baked. During 1950s and 1960s, Lu Yu Teahouse (not allow for photo-taking) took the lead with the mini-egg tart. Many people studied the origin of egg tart. One theory suggests Hong Kong egg tarts are an adaptation of English custard tarts as a result of being former British colony and adopted some British cuisine. Another theory suggests that egg tarts evolved from the very similar Portuguese egg tart pastries, traveling to Hong Kong via the Portuguese colony of Macau. It is one of the World’s 50 most delicious foods compiled by CNN Go in 2011. 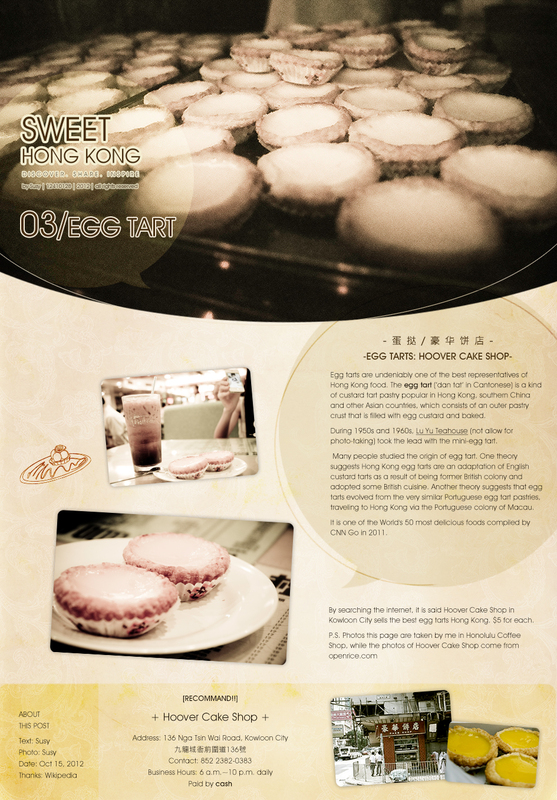 By searching the internet, it is said Hoover Cake Shop in Kowloon City sells the best egg tarts Hong Kong. $5 for each. You just couldn’t imagine how yummy i thought about this tart when my first try! luv your pic and design!